For others of the same name, see Charlie O'Connell (disambiguation) and Charles O'Connell (disambiguation). 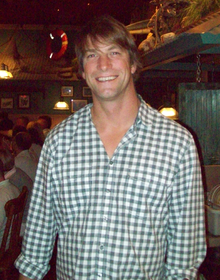 Charles O'Connell (born April 21, 1975) is an American actor and reality television personality. He is known for his appearance on The Bachelor, as well as appearing in several of his older brother, Jerry O'Connell's projects, including a starring role as Colin Mallory in Season 4 of the science fiction television series Sliders. O'Connell was born in New York City, New York, the son of Linda (née Witkowski), an art teacher, and Michael O'Connell, an advertising agency art director. His maternal grandfather, Charles S. Witkowski, was the mayor of Jersey City, N.J. O'Connell is of half Irish, one quarter Italian, and one quarter Polish ancestry. O'Connell appeared in small roles in such films as Dude, Where's My Car? and The New Guy, the latter of which also paired him with his brother Jerry. He obtained greater notoriety when he appeared with his brother in Sliders and then on the seventh season of the reality television series The Bachelor between March 2005 and May 2005. In the show, he chose Sarah Brice, a labor and delivery nurse who resided in Texas. They broke up in September 2007, got back together in late 2008, and though they spoke of marriage in interviews in 2009, they broke up again in April 2010. In two episodes of Crossing Jordan, entitled "Sunset Division" (season 2) and "Skin and Bone" (season 4), he played the onscreen brother of his brother's character, Detective Woody Hoyt. ^ "Jerry O'Connell Biography (1974-)". www.filmreference.com. ^ "The Pluck of the Irish". ^ "Rebecca Romijn's Marital Advice: Do It Backwards". ^ "'The Bachelor 7' couple Charlie O'Connell, Sarah Brice confirm split". ^ "'The Bachelor' couple Charlie O'Connell and Sarah Brice reunite". ^ "Entertainment News, Celebrity News, Celebrity Gossip - E! News". E! Online.